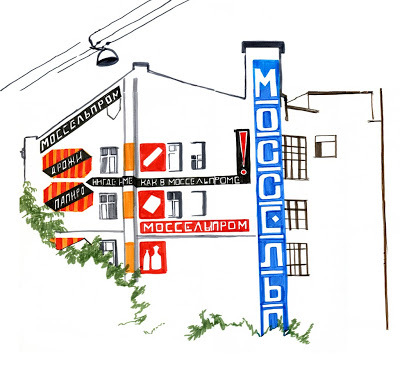 Last year I showed a few hazy reproductions of Meredith Nelson's drawings in Russia, captured on a digital camera. She came through town a while ago and I was able to see a few more. Now she has posted a full set of her Russian reportage work on Flickr, and it's a treat. The contrast is much clearer from the scans. Meredith began exploring this direction in a reportage seminar I taught during her final semester. The panorama below is from that body of work. At first she balked at the idea that these marker "comps" she'd made could actually count as the real thing, but they had great presence and freshness. She persisted, and the work that emerged–of abandoned buildings in St. Louis–got her a travel scholarship to Russia. She intended to study abandoned Soviet sites. That proved a little difficult, so she settled in to do reportage in Moscow as well as a few other cities. I found it quite difficult to select which images to show–the total set is quite winsome. The compositional economy and clarity of purpose (especially as expressed through color selection) are really great. Many are exquisitely minimal. Bravo Meredith! Meredith Nelson, Russian Reportage Series, 2009. Nelson, East St. Louis, Illinois, 2009.